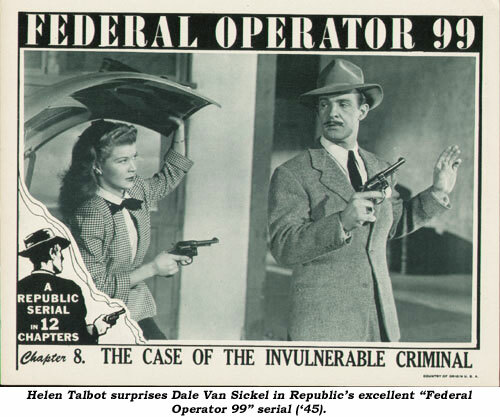 Serial Report Chapter 87-Dale Van Sickel, Marjorie Lord, Clyde Beatty. 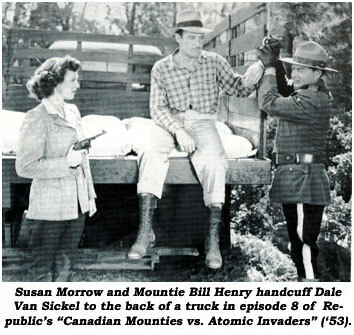 Stuntman/actor Dale Van Sickel was born November 29, 1907, in Eatonton, Georgia. After his high school graduation, Dale came to the University of Florida where he became a star football player. A knee injury curtailed his athletic ambitions. “Secret Agent X-9”, “Raiders of Ghost City”, “Master Key”) and Republic (“G-Men Vs. the Black Dragon”, “Captain America”, “Haunted Harbor”, “Masked Marvel”, “Manhunt of Mystery Island”, “Tiger Woman”, “Zorro’s Black Whip”), even Columbia (“Spider Returns”, “Holt of the Secret Service”, “Black Arrow”) serials before finding a home at Republic by ‘45 and 27 more action packed serials. 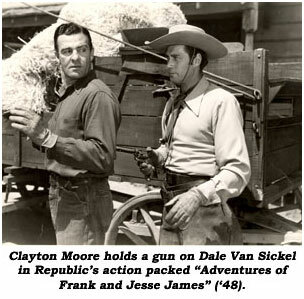 In Republic Westerns Dale can be spotted doubling John McGuire in “Bells of San Angelo” (‘47), Roy Barcroft in “Renegades of Sonora” (‘48), Douglas Fowley in “Susanna Pass” (‘49), Grant Withers in “Trigger Jr.” (‘50), Stephen Chase in “El Paso Stampede” (‘53), even Steve Brodie in “Guns of Hate” (‘48) (at RKO) and dozens more. Also adept at car and truck work, Dale put those talents to good use in all the modern day serials he worked on at the thrill factory. 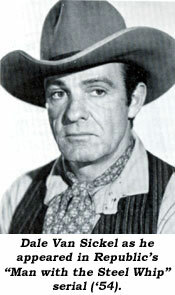 Dale was easy to spot in action films of the ‘40s and ‘50s, estimating he worked on over 200 movies along with dozens of roles and stunts on television shows such as “Bonanza”, “Roy Rogers”, “Kit Carson”, “Soldiers of Fortune”, “Superman”, “Sheriff of Cochise”, “Wanted Dead or Alive”, “Mike Hammer”, “Wyatt Earp”, “State Trooper”, “Stories of the Century”, “Yancy Derringer”, “Gunsmoke”, “The Untouchables”, etc. 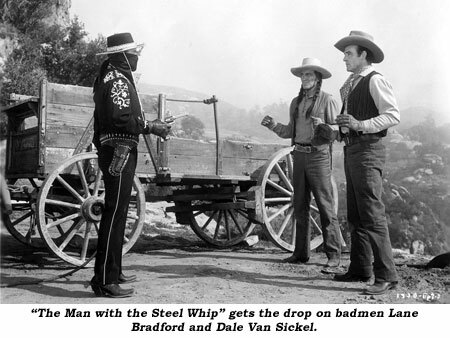 Dale Van Sickel had an almost 50 year career in Hollywood with some of his last work on “Batman” (‘67) and in “The Love Bug” (‘68) at Disney and as a stunt driver in the TV movie “Duel” (‘71) starring Dennis Weaver. Dale was one of the founding members of The Stuntmen’s Association of Motion Pictures. This group was formed by Dale along with Bill Hart, Loren Janes, Bob Hoy and other stuntmen, becoming the first such group in operation in Hollywood since 1961. 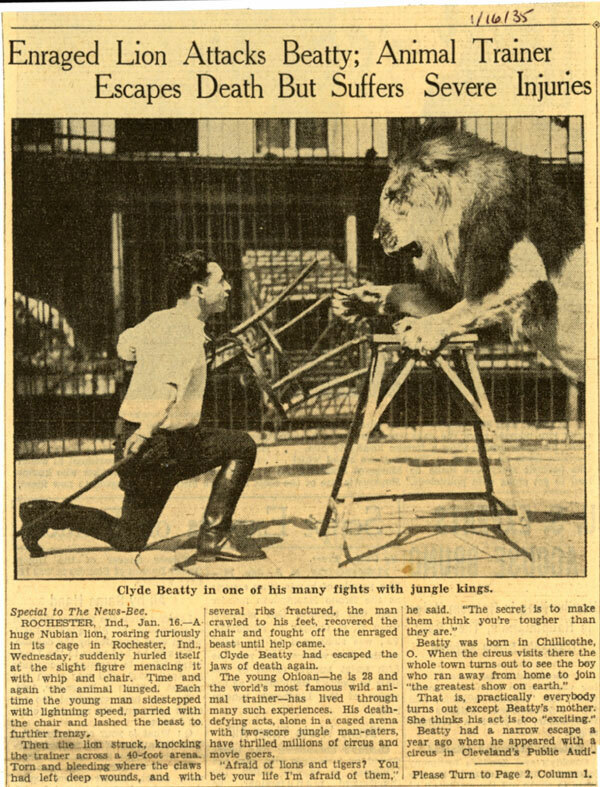 Clyde Beatty escaped the jaws of death from the wild beasts of the jungle numerous times in two thrill packed serials—“The Lost Jungle” (‘34 Mascot) and “Darkest Africa” (‘36). And don’t think for a minute it was all screen magic. Beatty was for real as you’ll read in this January 16, 1935 news article. In Chapter 3 of “Cody of the Pony Express” (‘50), Peggy Stewart and Dickie Moore are trapped in a ravine by stampeding horses. You can see them cower by an overturned wagon and hear Peg scream! But in Ch. 4, no one cowers and there is no scream as they are rescued by a rope from above by Jock Mahoney. 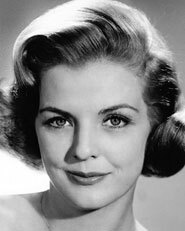 Poised and lovely Marjorie Lord, co-star of Universal’s “Adventures of Smilin’ Jack” serial (‘43) was born Marjorie F. Wollenberg July 26, 1918, in San Francisco. Her family moved to New York when she was 15. Good roles in “On Again—Off Again” w/Wheeler and Woolsey, “Forty Naughty Girls” w/James Gleason and Zasu Pitts, “About Face” w/William Tracy and Joe Sawyer, “Timber” w/Leo Carrillo and Dan Dailey, and others followed before her serial work opposite Tom Brown. 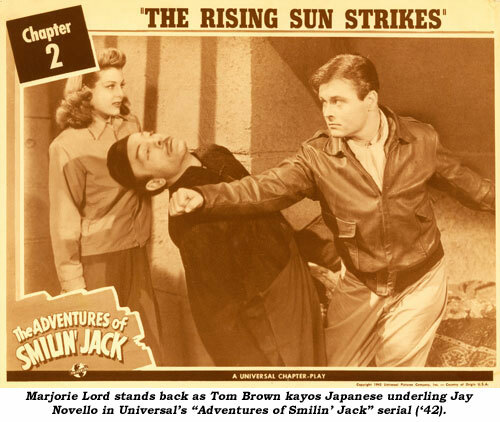 Afterward came “Sherlock Holmes in Washington” w/Basil Rathbone, “Johnny Come Lately” w/James Cagney, “Masked Raiders” w/Tim Holt, “Riding High” w/Bing Crosby and others before she turned to TV work in the ‘50s with “Racket Squad”, “Kit Carson”, “China Smith’, “Ramar of the Jungle”, “Schlitz Playhouse”, “Hopalong Cassidy”, “Wire Service”, “Lone Wolf” and many others before hitting it big as the wife of Danny Thomas for 228 episodes of “Make Room for Daddy” from ‘57-‘64 as well as many specials honoring the popular sitcom in ‘65, ‘67 and ‘70. After her third marriage, in ‘77 Marjorie phased out her career. She published her memoir A DANCE AND A HUG in 2005. The mother of actress Anne Archer (by her first husband actor John Archer) died of natural causes November 28, 2015, at her Beverly Hills home.